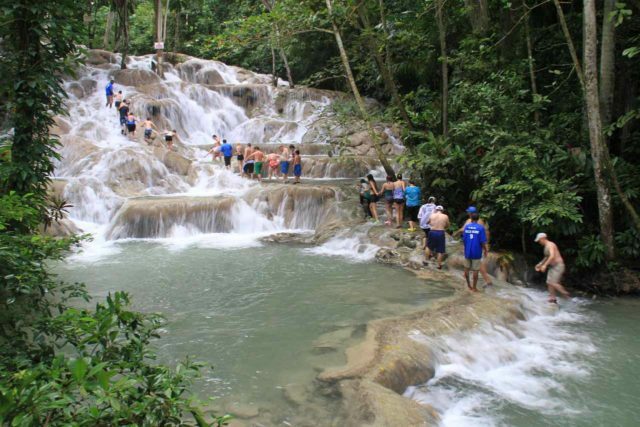 Dunns River Falls (or Dunn’s River Falls) has to be hands down the most popular waterfall in Jamaica. We wonder if it’s also the most popular tourist attraction period. 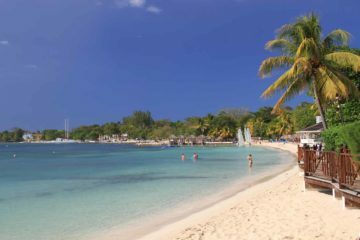 A reason why we think this is the case is that it’s within a short driving distance from the cruise ship dock in Ocho Rios. 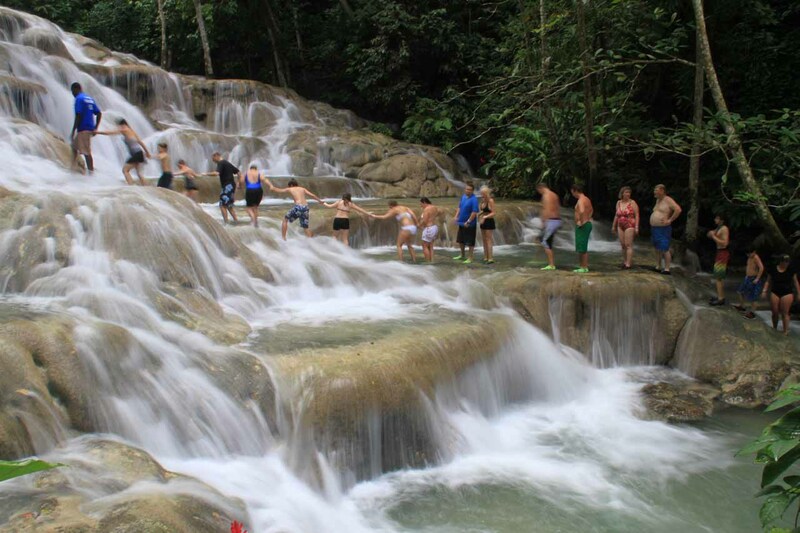 You add the thousands of cruise passengers disembarking and enjoying the falls with resort tourists from Ocho Rios and Montego Bay (which itself is within reasonable driving distance for a day excursion) as well as the locals, and it becomes apparent after doing all the math that you’ll have a mass of humanity experiencing this series of waterfalls. So was it worth the hype? Well even with all the commercialism for this waterfall (as it definitely felt more like a theme park than natural attraction), there was no denying the fact that this was clearly one of the most scenic waterfalls we’ve been to. 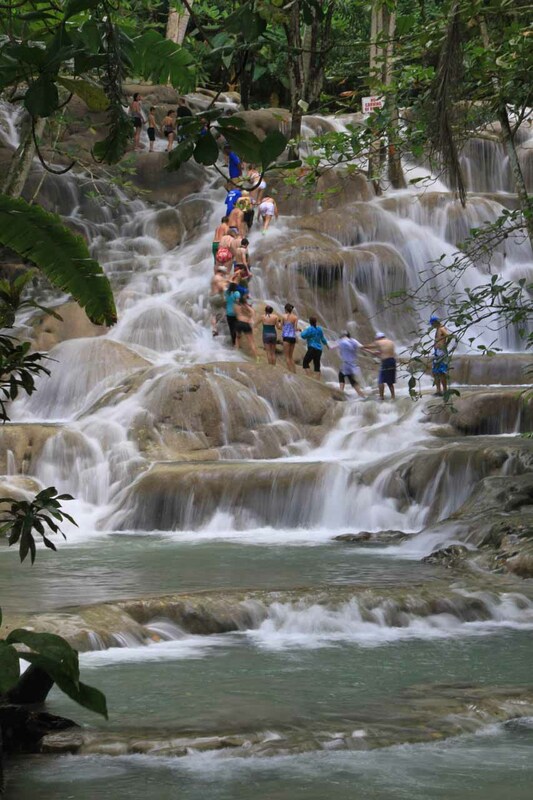 The falls consisted of multiple tiers of limestone cascades which were steep enough to count as waterfalls but also were not too steep so climbing on them was possible. 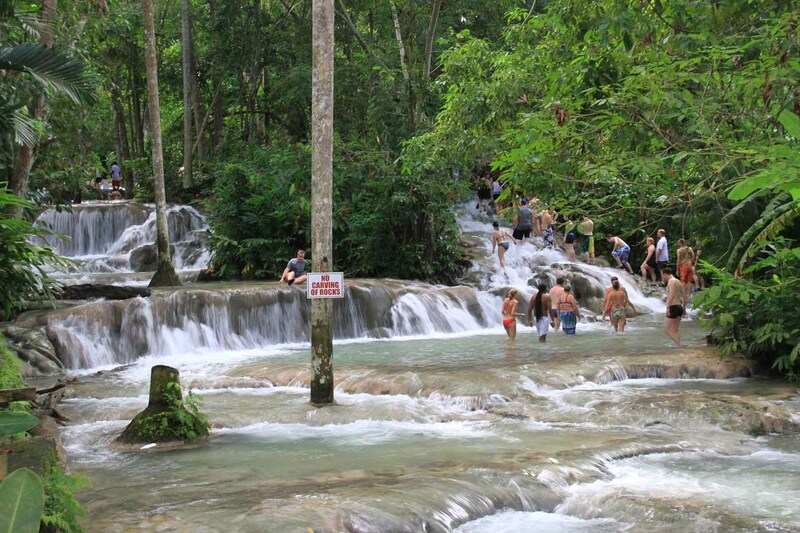 The underlying limestone bedrock was what gave the falls its character and scenic appeal. But the scenic appeal didn’t end there. 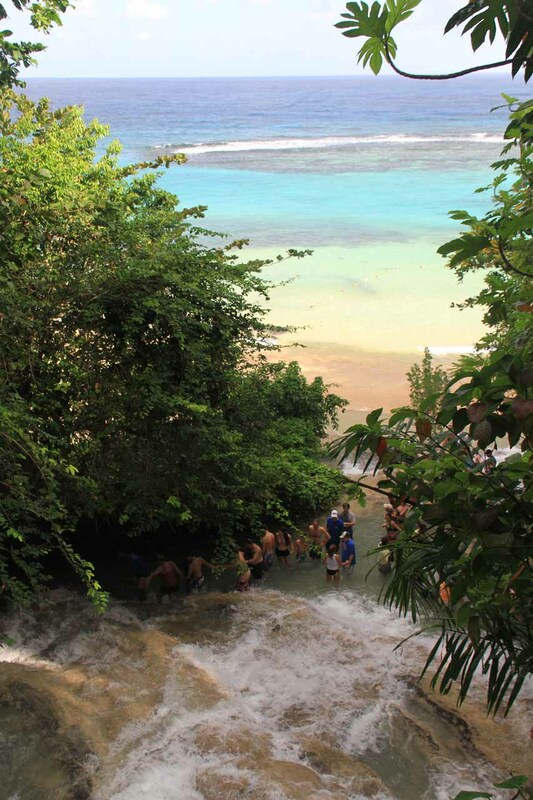 The lowest tiers of the falls tumbled beneath a bridge and eventually joined the Caribbean Sea with its blue-green waters fringed by soft white sand. 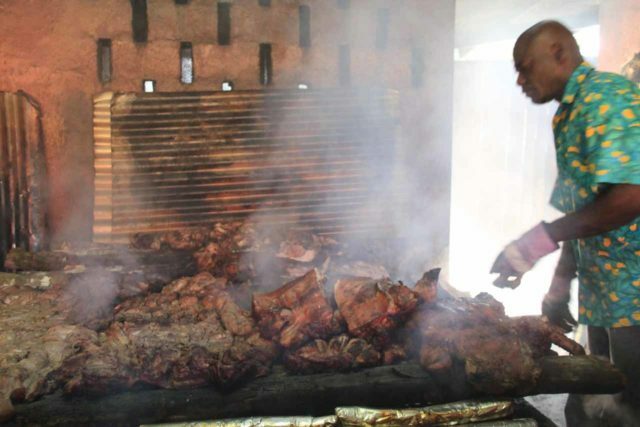 Yep, you heard right! 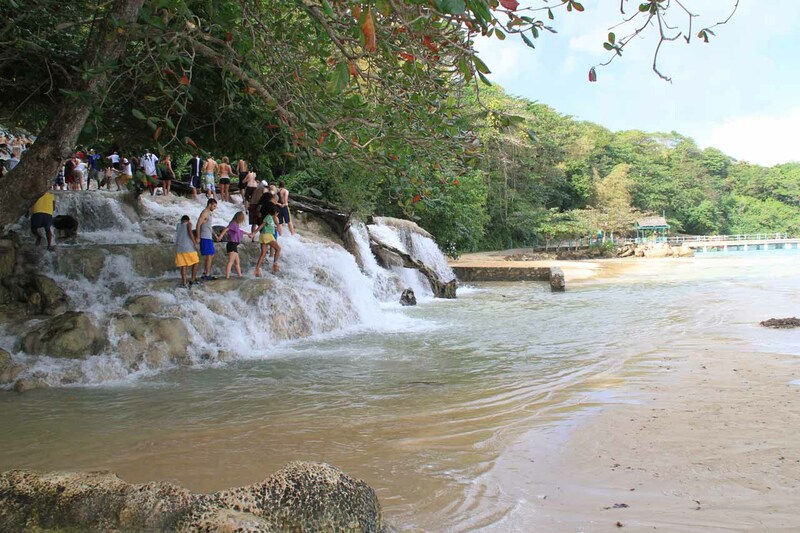 It was one of those waterfalls that you can count as those falling into the ocean! 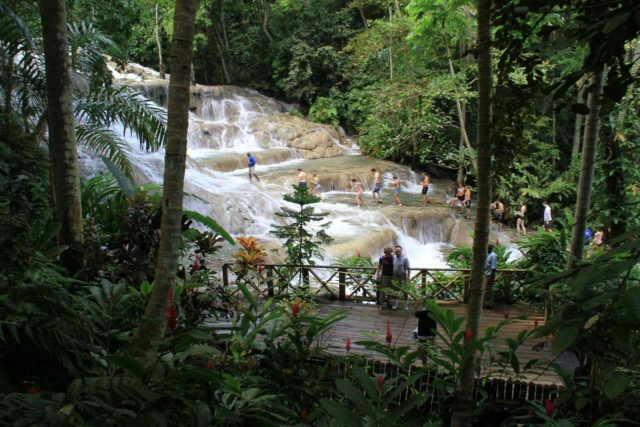 Add to this that Dunns River Falls was also a typical “play” waterfall where just about every tourist that would come here would feel compelled to climb up all the tiers of the falls to cool off from the tropical heat, and you have a perfect storm of all the things that would attract visitors to this one place. 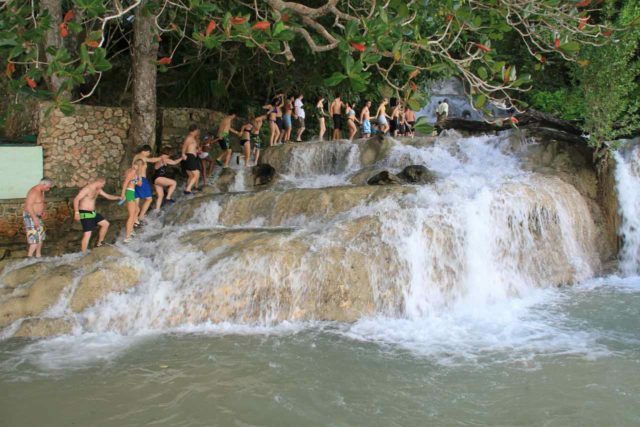 So don’t be surprised to see human chains of people holding each others’ hands to facilitate walking up the waterfalls. It was practically the tourist ritual here. 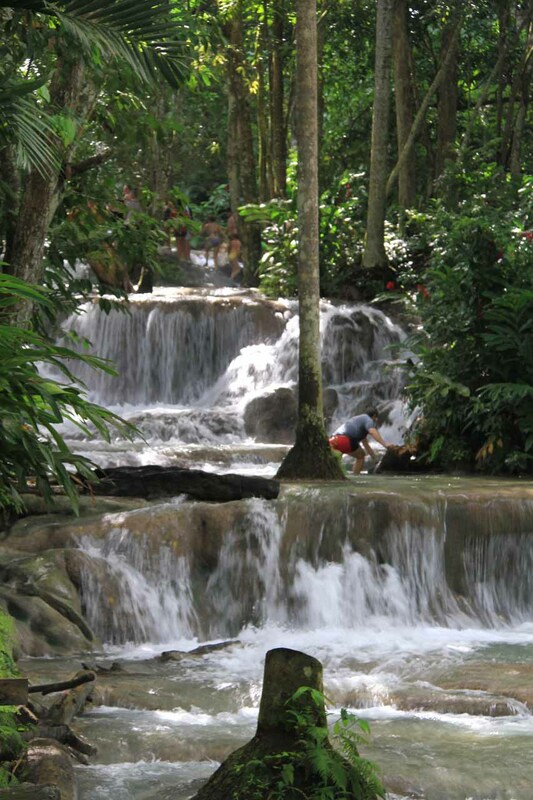 As for the specifics of the waterfall experience, here was how we saw it. 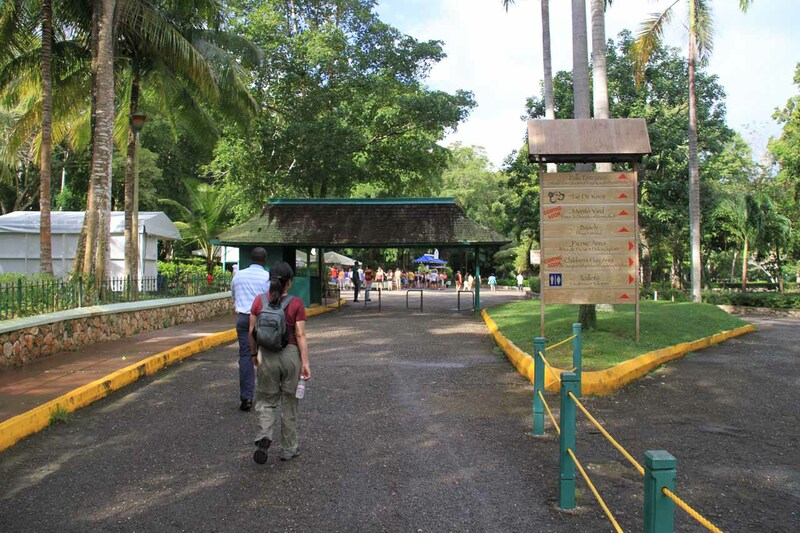 After going through the entrance gate (we had to make sure we wore our wrist-strap denoting proof-of-admission), we then followed a wide and paved walkway that made its way alongside the falls. 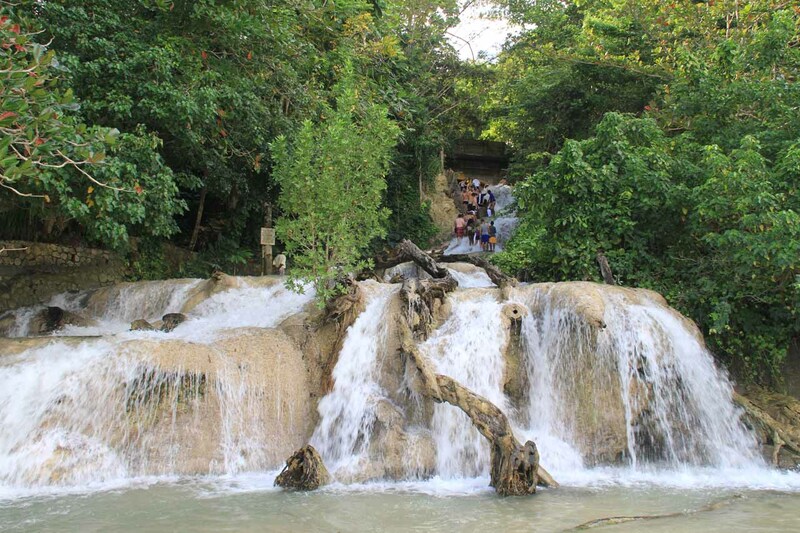 At first, the wide walkway passed by several stands containing crafts, food, water shoe rentals, and even local guides waiting for us to hire them to help with climbing the falls. Once we were past all the tents and queues for guides, we saw spur paths leading towards the fringe of the river at various sections to catch glimpses of the waterfall’s many cascades as well as re-entry/exit points to the river itself if we intended to get wet and walk in the river itself. 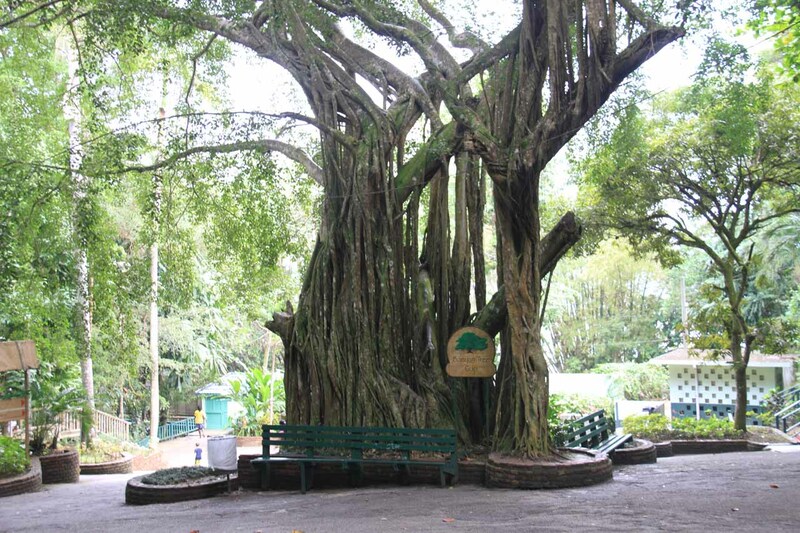 There was even a banyan tree in the middle of the paved walk. 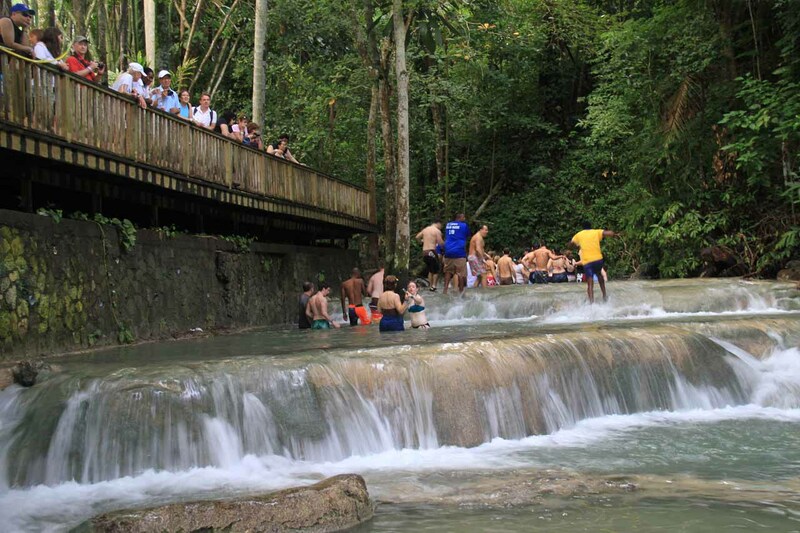 Since we were primarily interested in taking photographs of the falls, the river-fringing walkways were our best bet to capture the action. As much as I wanted to get into the river and capture the action from there, I needed to have waterproofing accessories for my DSLR camera , which I didn’t have. So I couldn’t take the risk. 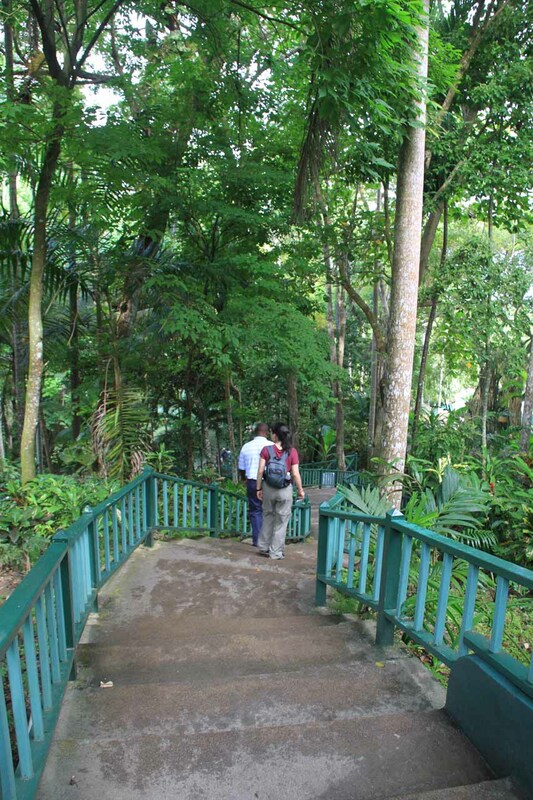 Nonetheless, we were still able to see the vast majority of the waterfall’s sections from the safety of those walkways. However, I did recall there were a few small isolated sections that we couldn’t see unless we went in the river itself. 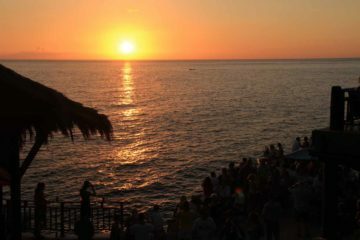 Once we descended all the way to the bottom of the walkway, we were at the beach. 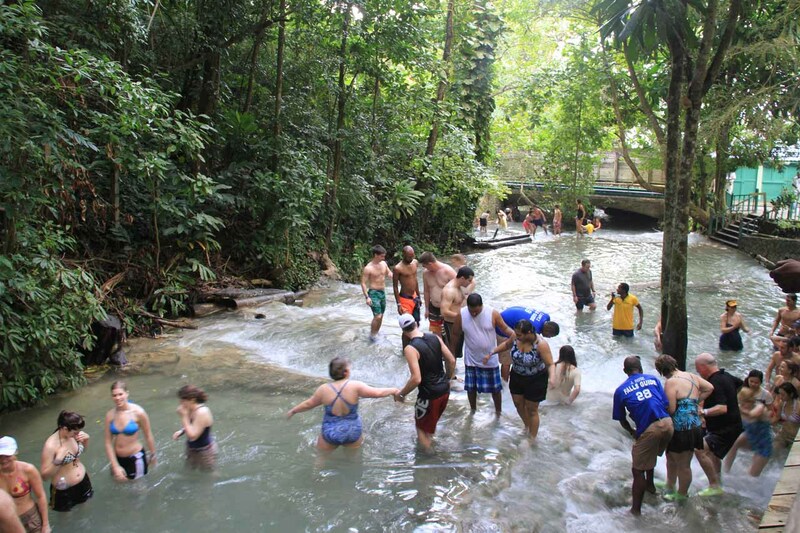 While the beach alone was a good place to spend time playing and cooling off from the tropical heat, this was merely the starting point for doing the obligatory climb up the Dunns River Falls. This was where the long human chain (i.e. strangers holding each others’ hands to maybe aid with balance and reassurance) began. This first section of falls (which I’m calling the “bottommost tier”) involved maybe a half-dozen sections of climbing. It looked daunting when viewed from the top (see photo at the top of this page), but it didn’t seem like that big of a deal when going up. After rounding a bend and going up a few more tiny cascades, then the human chain entered what I considered to be the main section of the falls. 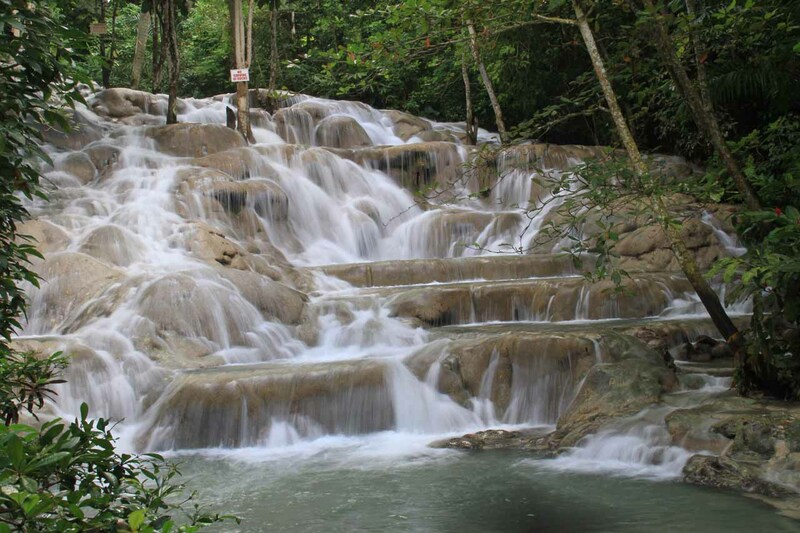 This was where the Dunn’s River spread out and flowed over a tall and wide limestone slope that was easily the most photographed spot. In fact, they had plenty of viewing areas up part of the profile of the falls to ensure there was no shortage of photo opportunities. Once at the top of this main section, the stream briefly flattened out over a few more smaller cascades before hitting a fork. The left side looked like it flowed over a trio of steeper cascades and it didn’t appear that anyone was going up that way. The right side looked like it flowed over a few more gentler sloping cascades and this was the way we saw most tourists take. This part of the stream also became hidden away from those not willing to go into the water. Since I didn’t risk bringing my DSLR camera with me into the water here, I didn’t capture any more additional photos about that section. Eventually after this last section, the stream bent back towards the walkway where there was the uppermost exit. That concluded the typical “get wet” tour, and that was where participants would rejoin the paved walkway and dry off. The stream really flattened out further upstream of this point so it was pretty much the end of the most interesting part of the climb. We saw a handful of people stay in the water and keep going upstream, but it didn’t look like there was much more to see from what we could tell. The turnoff for Dunns River Falls is right off the main highway (A3) about 4km west of Ocho Rios. It took us roughly 15 minutes to ride from the Sandals in Ocho Rios to get here. 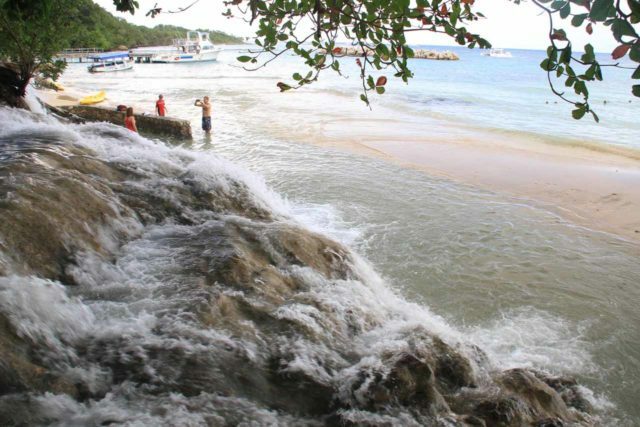 Ocho Rios was about 100km east of Montego Bay (Mo Bay). The admission price at the time of our visit in late 2011 was $20 USD per person not including transportation costs.